This is part four of a multi-part series titled “Limiting Factors – A Genesis of Blood Doping”. It comes to FasterSkier from Sammy Izdatyev. You can read part one here,part two here, and part three here. While blood doping research caused a variety of opinion about its efficacy worldwide, the reception wasn’t unanimously positive among even Björn Ekblom’s closest GIH colleagues and coauthors. While P.-O. Åstrand was convinced about the results and never expressed doubts about the veracity of the findings expressing this opinion in lectures, media and journal articles throughout the 1970s, all weren’t so enthusiastic. Björn Ekblom recalls that there was a minor competitive situation at the GIH, not between him and Saltin, but between and Saltin and Åstrand. The younger researcher didn’t want to be only “Peo’s student” without his own students and subsequently, in 1973 he took a professorship at the August Krogh Institute and moved to Denmark. One who encouraged him to do so was Eric Hohwü-Christensen, the same Danish physiologists who had founded the GIH decades earlier. Whereas when Ekblom didn’t see any correlation between Vo2Max and hemoglobin concentration, he concluded that the speculations about ”viscosity problem” and “the optimal hematocrit” were wrong and that blood doping could in theory work. Hermansen drew the exactly different conclusion about the material. Because there was no correlation between the two, hemoglobin concentration was almost meaningless figure because almost every value was as good as the next one from Vo2Max viewpoint, and elevating hemoglobin would just bring the subject to another equally good value. Of course, nobody formed their views in isolation and as Hermansen and Saltin were coauthors of many papers and Ekblom notes that Hermansen’s hemoglobin concentration views also influenced Saltin on the matter. Those who were against the results didn’t believe in the effect for a variety of reasons. But more research was of course needed, either to prove or disprove the findings. That we got it right makes me feel happy but not malignant – that is how science just works. One sees something to prove – and if there are people who think that it is wrong then they take their attempts to disprove it in some way even when it is always difficult to prove things. In the light of the oft-repeated – albeit in essence correct – statement, that blood doping was “invented” by the 1972 research paper, one should still pause for a moment about the implications of the paper, because it is easy too read too much into its conclusions. What was actually the new information from the 1972 study? As the paper states, the goal “was to investigate the influence of relatively small changes in the hemoglobin concentration on human physical performance capacity and on the different variables in the oxygen transport system”. First, it took no position whether it would be beneficial to increase hematocrit level beyond the “normal” physiological range and the highest hematocrits measured after blood infusions were still around 46-47 % and thus it wasn’t obvious that it could be beneficial to increase hematocrit to 50 % or 60 %. The only finding was that the “adapted” hematocrit was suboptimal for one reason or another. Other two problems brought up against blood doping were more technical than fundamental. One problem brought up also by Lars Hermansen wasn’t the capability of the stored red blood cells to carry the oxygen for the muscles, but its capability to release the oxygen to the muscles. This put a lot of emphasis on the enzyme 2,3DPG, a blood component that was identified in 1967. While the 2,3DPG is today more-or-less an item most researched by clinical hematologists, but for a brief time period in the 1970s, 2,3DPG became one item of importance for exercise physiologists when researchers measured how its amount changed relating to training status, at high altitude and during and after exercise. There were voices within the exercise physiology community, that the beneficial effect of high altitude training wasn’t the increase in hemoglobin concentration, but the increase in 2,3DPG-level when red blood cells released more oxygen for the muscles. Ekblom’s view is that 2,3DPG doesn’t play a significant role in oxygen delivery and the discussion around it in the 1970s didn’t bother him that much even when some illness could render it relatively more important. The other alleged problem was that exercise capacity was reduced during the relative anemia between blood removal and reinfusion and correspondingly a blood doper couldn’t give the 100 % effort during the weeks preceding a major competition. While the observation had its practical implications, this problem didn’t address the “workability” of blood doping from a fundamental viewpoint but was more related to the applicability for doping purposes. *Wilson followed closely the ice hockey circles of the nordic countries, and the first Swedish and Finnish ice hockey players had their professional contracts shortly thereafter with the Winnipeg Jets team. The results came back roughly similar to the 1972 study. 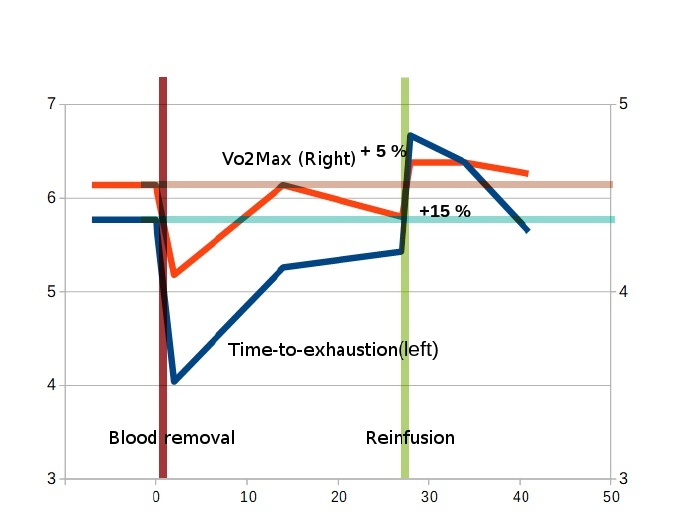 While no ”overnight” data was measured, maximal oxygen uptake fell after blood removal and was elevated by an enormous 8 percent after reinfusion when compared to the pre-removal data. The latter figure coincided with hemoglobin concentration going some 5 % above the normal. While their new research had been submitted and waiting to be published, a team of West German researchers had also paid interest into the subject matter relatively quickly after the 1972 paper and secured funding and a mandate to research the subject. They had their research published in 1975. The West German researchers weren’t also just random guys, but very eminent scientists. The most recognized name is Wildor Hollmann, whose research on maximal oxygen uptake and heart was quoted widely internationally and Heinz Liesen who would become an eminent coach in many types of sports including football and cycling. It has been since claimed that the third researcher Richard Rost had tested the method with elite level swimmers already in 1972 (Spiegel, 1990) and interestingly Ekblom also had mentioned a West German swimmer having broken the national record with the help of blood doping. Ekblom’s thinks that on a general level, the German language research was undervalued and the to illustrate this, research paper vanished almost into the memory hole and Richard Rost is almost without exception misspelled as ”von Rost” when the study has been briefly mentioned in some blood doping literature reviews. “For us, the issue was completely clear after the 1976 research”, is the significance of this confirmation study according to Ekblom, when 2,3DPG and cardiac output were now measured. Bengt Saltin also becomes later convinced about the blood doping issue and became an anti-blood doping activist commenting on the issue in media and taking it as one of his focuses as a member of many sportorganizationsns. Hermansen, on the other hand, remained unconvinced. “Lars Hermansen dissertation showed no connection [between hemoglobin and Vo2Max] and that was his opinion until the end”, Ekblom recalls. His Norwegian friend and coauthor of many papers died unexpectedly in 1984, only a few weeks before his 51st birthday. 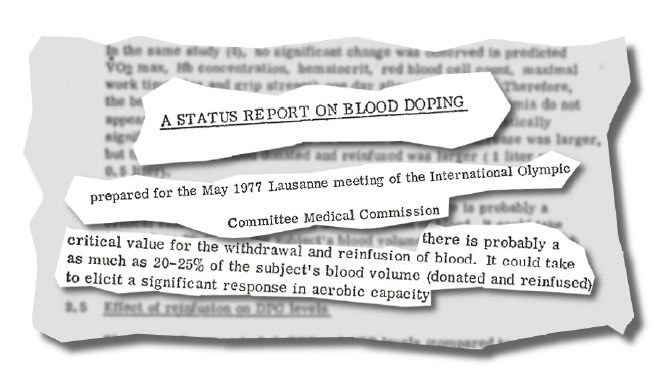 Even when the blood doping literature reviews list only three published blood doping research papers between 1972 and 1975 and the few reviews were very ambiguous about interpreting the available evidence, the issue gained a huge amount of media attention in 1976. The first instance was when the Norwegian Olympic team wrote an official letter to the International Olympic Committee (IOC) warning them about the practice only a days before the Olympics. The idea for the letter came from the team doctor Paul Lereim, who was also a member of the medical commission of the International Speed Skating Federation and had noticed that east European skaters rose rapidly in the early 1970s and broke the traditional hegemonies. 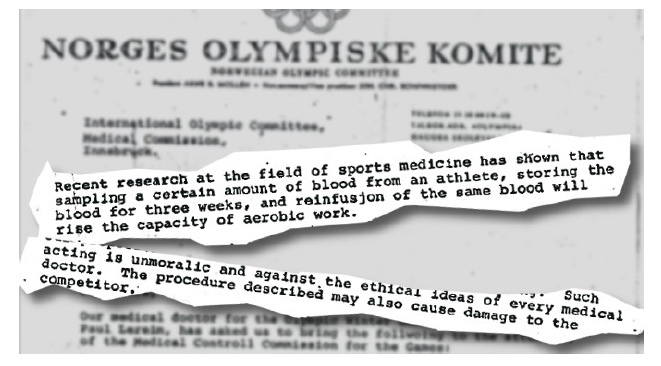 In 1976 The Norwegian Olympic Committee warned the International Olympic Committee about the existence of blood doping. (IOC, 1976) At least some voices wondered whether it was real concern about sports ethics or an attempt to take the punch bowl away not that everyone knew about the method. There are always many variables in cross-country skiing affecting the outcome and while the Soviet athletes were triumphant, no ”hard” evidence was presented against them, and even the circumstantial evidence wasn’t that much better and only a few can even recall today the few names that circulated in passing in the media as suspected ”blood dopers”. Not that many people even followed winter sports and it took until the Montreal summer games until a perfect blood doper was found in the character of endurance runner Lasse Viren, who not only came from Finland but whose year-to-year performance progression was so abnormal and in many eyes consistent with blood doping. There are always some athletes that are just good and there was nothing overtly suspicious about Viren’s early career, when he progressed gradually from the late 1960’s onward becoming clearly the best endurance runner of the year 1972, when he broke three world records (2 miles, 5000m and 10000m) and he was also double Olympic gold medalist (5000m, 10000m) when he during the 10000m finale he simultaneously won Olympic gold and broke the world record despite falling during the race. Then he vanished almost altogether and there are no significant achievements during the years that followed. Whereas he was the best runners of 1972, he managed to win bronze at the 1974 European Championships in athletics and in 1975 for 10000m – the year preceding the Montreal games – he was 24th and over half a minute slower than his own record only three years earlier. *This was almost certainly a reference to Anders GaÅNrderud, who was a student at GIH. Him paying some interest in blood doping in 1971 was republished in the American media, but Ekblom is convinced that the didn’t blood dope. ”When I tested him at the GIH, I didn’t even want to take the lactic acid test blood from his fingertip”, Ekblom recalls. If the case against Viren was only circumstantial, there was also no consensus view whether the method was beneficial at all, a question that many researchers wanted no to settle once and for all. Correspondingly there were several dissertation theses and research papers originating particularly from the English-speaking world in the wake of the Montreal games. Some of these weren’t published at all and some were published only in a short abstracted summary or random news items. Almost all of these were very carefully conducted with double-blind procedure and control group and some had even questionnaires to exclude the possibility that the participants had any idea whether they had been blood doped or infused only with saline. Even when international news agencies were eager to publish these findings debunking the efficacy of blood doping and many authors referred to them, it is noteworthy that even the researchers themselves were acutely aware of the limitations and even might’ve noticed the problems. ”During Ekblom’s study 60 % to 140 % more blood was infused than in Williams’  study or the current study”, wrote Andrea J. Frye in her unpublished 1977 thesis. ”Also, the time between [blood removal] and reinfusion was significantly greater, allowing time for more thorough regeneration of cells in vivo”. I should note that the statistical analysis showed no difference. However, almost all of the subjects who received the blood, as compared to the saline placebo, experienced an improvement in performance. But, since the difference between the groups was not statistically significant, we had to conclude that blood doping was not effective to increase running performance. However, that may have been a type II statistical error, in which the findings failed to reject the null hypothesis. Because the positive effect was almost seen in the raw data, Williams decided at this point to conduct a third study to settle the question once and for all using a higher amount of blood. If the reader is confused about why at least four researcher teams used the ”early” Swedish protocol already proven having issues, there were two reasons for this. First, US Food and Drugs Administration limited storage period to 21 days and secondly most of the English-speaking had no idea about the earlier inconclusive attemps of the late-1960’s and they might’ve been under the impression that blood doping was easy and that Björn Ekblom and Alberto Goldbarg immediately succeeded in causing the surplus of red blood cells in their 1972 study. While Björn Ekblom had mentioned this preceding research occasionally in Swedish media outlets, the Anglo-Saxon world had to rely heavily on the two published blood doping research papers originating from Sweden in which there is not one word about the earlier inconclusive attempts. Thus the media outlets that were eager to report these ”inconclusive” findings showing no benefit were under the wrong impression that this research was 100 % original breakthrough research and actually superior to the Swedish research with placebo control groups (which was partly correct). While Melvin Williams and Ekblom knew each other well and even exercised together when Ekblom was visiting Palo Alto in the 1970s, Williams has since explicitly stated that even he wasn’t aware of these earlier 1960s blood doping attempts at the GIH. It is true that if an impartial arbiter weighed in the sheer amount of pro- and con studies on blood doping, the case was very open and even slightly against the efficacy. While skeptics hadn’t questioned the data itself, there were some who took a deeper look into the source material itself and questioned both the inner consistency and how the data was reported. While even modern researchers customarily quote the canonical Vo2Max and performance improvements of 9 % and 23% from the first blood doping study, the increases are lower (5 % and 15 %) when the blood boosted ”peak” is compared to the baseline value instead of to the anemic level preinfusion level. My view was that even if [our subjects] were not really fully recovered in hemoglobin concentration, the change after reinfusion would be enough from day-to-day to see the effect even if we were from lower-than normal value, and that was also the case that some of the guys we have had had not been recovered during 30 days. One could say [that] some of the performance effects could have been that they had restored an anemia situation, on the other hand, there are a lot of – at least a few – subjects who were normal when they got the blood back and still you could see this effect on performance and so forth. Even if one compares improvements to the pre-blood donation data, the improvement in maximal oxygen uptake was 4.8 % in the first published study and 8 % in the 1976 research paper, which are significant figures and the latter was even statistically significant (statistical analysis wasn’t conducted on the first one between the two values). Of later blood doping specialists particularly Professor Norman Gledhill from York University has later also questioned whether the data on maximal oxygen uptake and hemoglobin concentration is fully consistent in these first studies where the benefit was seen. His main problem with the three Swedish and West German studies wasn’t that the absense of increase in maximal oxygen uptake, but that the increase was too large when compared to the elevation of the amount of oxygen carrying red blood cells. But how come Vo2Max increased more than hemoglobin concentration if causally the link was that oxygen delivery caused the increase in Vo2Max? Even when the observation raises the question about the training effect and a fraction of improvement, Ekblom found part of Gledhill’s criticism strange because the oxygen delivery chain is a very complex one and there are always variables that can ”interfere”, and correspondingly there are almost always some seemingly unexplained anomalies in the measured data. In addition, hemoglobin concentration isn’t always the best predictor of how much red blood cell count has been increased after blood infusion, because it is only a relative figure and while usually blood volume returned to normal and there was higher hemoglobin concentration, occasionyll blood volume remained elevated, masking the increase in total hemoglobin, which is a variably more closely related to Vo2Max than hemoglobin concentration. While it is totally true that hemoglobin concentration was only slightly elevated (2-5 %) in the three reinfusion showing benefits associated with blood reinfusion, total hemoglobin was elevated on average by some 5-10 percent in these same studies. In addition of knowing a few anecdotal insights from the field about successful blood dopers, Ekblom – who had become a full professor in 1976 – later wrote that there had been 30-35 reinfusion tests conducted at the GIH in the 1970s, so he had access to more laboratory data than almost all the ”skeptical” researchers, because only a fraction of this material had been published in the two reinfusion studies in the 1970s. (Ekblom, 1982) Thus he had good reasons to be convinced that he and his fellow GIH researchers were on the right track despite a few irregularities in their research papers. They had also interest in proceeding with the blood doping research on track, but the research never materialized. “As I have stated, there was a lot going on at that time”, Ekblom recalls how busy the era was. Whereas almost all the research thus far had stored the removed blood in refrigerated form, the Canadians employed relatively new high-glycerol freezing technology, also known as cryopreservation, a technique more known from the world of science fiction. Instead of storing the blood at +4 degrees in a refrigerator, they separated red blood cells from the plasma and added glycerol to keep the ”dry” cells in liquid and froze the mixture at -90 degrees after which the aging process halted altogether. This technique allowed them to wait as long as possible before reinfusing the blood because the blood remained in high quality regardless of whether the blood remained stored for one day or for ten years. Even when Ekblom and his coauthors had used well-trained subjects in all of their blood infusion research, they were still far from international level athletes. Now the subjects of the Canadians are described as ”highly trained male track athletes of national or international caliber” with the mean relative oxygen uptake being 79.5 ml/kg/min and the highest value being level 87 ml/kg/min, which would’ve been ”world record” only a decade earlier. They were also familiar with the rigorous training program and had a body fat percentage of around 6-8 %. This Canadian study would actually be one of the few blood doping research papers with elite level athletes because anti-doping regulations would make it practically impossible to use competing athletes for doping research of this type. The third improvement was that the testing protocol itself was also very sophisticated and there were a control group and double-blind protocol. One group received blood infusion first whereas the control sham infusion of saline and a day later the roles were reversed. 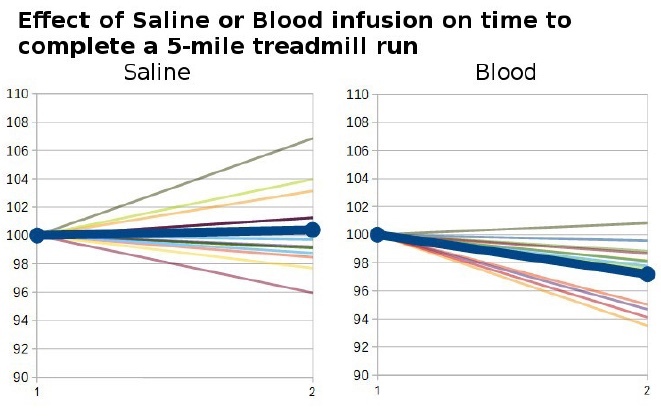 Vo2Max increased constantly by 5 % and maximal working time on a treadmill increased by 35 % in the reinfusion group and there was no improvement in the sham group receiving only a miniscule amount of saline. Fred J. Buick – one of the authors and a graduate student of Gledhill – also told later that the participants were breaking their earlier personal records during the time period, so the improvement in Vo2max had some real life implications as well and it wasn’t just a statistical artifact. Then how to compare this paper to the earlier blood doping papers where an increase in Vo2Max was seen? One clear improvement in the paper was that both hemoglobin concentration and total hemoglobin increased very significantly, by more than 10 %, but the other results came back roughly similar. The 5 % improvement in Vo2Max measured in the 1980 research paper was very much in line with what the Swedes and West Germans had measured several years earlier as well as the 35 % improvement in a time-to-exhaustion test. In light of the current knowledge, it is almost impossible that training effect was the cause of the Vo2Max and performance boost of the Swedish research papers, but we do not know if it was a contributing factor in the Vo2Max increases. And indeed, this time there was very little room for speculation about placebo effect or training effect and both the authors and commentators could pretty conclusively conclude that the hemoglobin elevation caused the increase in Vo2Max and performance. But if the Canadians had in the first place objected to some strange anomalies in the Swedish and West German research papers, their own research paper has at least one strange anomaly. Whereas hemoglobin concentration had returned to normal in 16 weeks, surprisingly the maximal oxygen uptake hadn’t followed, but remained still elevated and hadn’t fallen at all. The same phenomenom took place in both of the groups. The authors speculate about increased maximal cardiac output achieved through above normal training load during the time period when hemoglobin was artificially elevated. Whereas International Association of Athletics Federation (IAAF) had specifically warned before the 1974 European Athletics Championships that blood doping was dangerous and wouldn’t improve performance, Norman Gledhill had met Arnold Beckett of the IOC Medical Commission in 1978 and discussed with him about his findings convinced Beckett that the method would work in practice. Williams had never questioned the validity of the data of the Swedes and West Germans, on the contrary, he was truly puzzled why the maximal oxygen uptake was elevated whereas the other research gave so inconclusive results. Now he came up with a possible theory relating to the testing protocol itself because the Swedes had used Vo2Max test as the same test where performance time was measured. Vo2Max test is an incremental test and his armchair speculation was that the subjects hadn’t reached their true potential Vo2Max in the first tests and when they ran for a long time after reinfusion, they also reached their real Vo2Max. “Thus, if subjects realized they were receiving an experimental treatment they may have been motivated to perform to a more exhaustive level, possibly increasing their Vo2max recordings”, he speculated. ”In some of the studies, increases in Vo2max were on the order of 300-400 ml, which might possibly be explained by the greater endurance time in these same studies. The question is, ”’Is the increased V02max the cause or the effect of the increased endurance time?’”. There was a noticeable gap between Melvin Williams sending his article to Journal of Drug issues and when it was published because by the summer of 1980 he had pretty much finished his third study on the subject and had changed his opinion about the inefficacy/efficacy issue almost 180 degrees. Tapio Videman had been the coauthor of the first known study conducted outside the GIH to test whether blood doping worked in 1971 and didn’t find much benefit with the method. In 1977 he had sent the study to be published in a prestigious journal, but now in 1979, he coauthored a letter to the International Olympic Committee proposing blood doping testing in order to curtail its use. The history will always see Björn Ekblom as the eminent physiologist who came up with the ”blood doping” research line in the mid-1960s and conducting the major studies on the subject that opened the way for other researchers to follow his footsteps. Still, these mainly North American researchers such as Fred J. Buick, Norman Gledhill, Robert Robertson, and Melvin H. Williams have their place in the history, pushing the discussion forwards after it being in the intermediary limbo caused by all the conflicting literature. When the pertinent question of the 1970s was whether it worked at all, the focus shifted on what procedures constituted blood doping, should it be banned and what relative importance should be placed on its detection. I can propably say that I got the impression that the IOC changed its position because our research became more credible. The problem earlier was that Americans had much influence on the top people inside the organizations and we were considered just some “in Europe” who just did research on this and that. Even when it was the Anglo-Saxons who on some level convinced the sports governing bodies, Ekblom wants to emphasize that it was P-O Åstrand who did a lot of effort in making the GIH research known in the United States when he visited the country lecturing about blood doping, for instance in 1973 at the Berkeley University. Because this has been an essay on the intellectual origins of blood doping, we are slowly but surely approaching the end of this essay. The new decade gave also another interesting development. While there had been gossip about the use of the practice for roughly a decade and one Dutch cyclist had even admitted taking transfusions in the mid-1970’s after he had developed a persistent anemia after a crash where he lost a lot of blood, the early 1980s is usually considered the time when the first solid evidence of blood doping practice came into light. While even The New York Times published in 1981 the news item about Finnish endurance runner Kaarlo Maaninka admitting having used the method at the 1980 Summer Olympics where he won two medals, more interesting confession had taken place a month earlier when the retired Finnish steeplechaser Mikko Ala-Leppilampi told publicly his story in the Finnish media. (Wessman, 1981) The athlete that had ended his career pretty much after he didn’t make it to the 1976 Olympic team not only revealed having used method as early as in 1972, but he also was under the impression that he was left out of the ”inner circle” of blood dopers a year earlier when he was 5th at the European championships in 3000m steeplechase. He was heavily under the impression that at least some Finnish athletes had benefitted from the method a year earlier and that the method was widely used by the Finnish runners mentioning even Juha Väätäinen and Lasse Viren by name and emphasizing that a non-blood doped Finnish runner was actually an exception – not the other way around. Finnish MDs had maintained that the operations couldn’t have been carried out because there were no freezing technologies and there was then and is today debate about how applicable autotransfusions with refrigerated blood are from doping viewpoint. “In fact, blood-boosting is out if the question in Finland”, had sports MD Pekka Peltokallio and a friend of Lasse Viren claimed shortly after the 1976 Olympics. ”We haven’t got the special facilities for properly preserving the blood. The nearest facilities are in Stockholm and in Holland”. (Raevuori & Haikkola, 1978) Ala-Leppilampi revealed one answer to this mystery – almost all the transfusions used by the Finnish athletes were from the abundant supplies of the Red Cross blood bank. He still mentioned almost in passing that autotransfusion had been used, but in order to avoid the anemia recovery problem, the blood was stored after high altitude training when hemoglobin concentration was high in order to make the relative anemia less severe. His own initiation came in 1972 on the eve of the summer Olympics, when the Finnish Olympic team gathered for a dinner in a conference center in Finland. Dr. Pekka Peltokallio – the accredited team doctor – discussed with the athletes one-by-one, and when it came Ala-Leppilampi’s turn, the doctor asked whether he’d be interested in taking advantage of ”medical aids”. ”OK, let’s use transfusion”, the runner replied. In the early 1980’s I was at a sports medicine conference in Colorado, and gave a presentation on blood doping. Some advisors to the American Olympic team questioned me in detail about the procedure and its effects. When discussing the case of Mikko Ala-Leppilampi in media, Ekblom stressed that the method was banned under the IOC’s general clause even when it wasn’t specifically listed as a banned method by the rules. There was a new line of discussion whether the method should be banned or not and even whether it already was banned or not now that it was shown definitely that it worked. The issue was a complex one with various opinions and even definitions, for instance on what constituted a ”doped” hemoglobin value or whether it was fair that rich countries could have enough resources to send their athletes to altitude training whereas poor countries didn’t. But that is another story for another day altogether. This is part four of a multi-part series titled “Limiting Factors – A Genesis of Blood Doping”.